There's still loads to do but I'd like some input to work on stuff. I know I'll add some colors to the palette later on but I just want to make sure the shape is right first. on the first sight it's definitely readable as a car. But some things which hitted my eyes were the size of the wheels, and the shape-curves of the bonnet and the luggage space are of compared to their inner curve - causes wrong forms. And it seems that the depth seems to be to small too. since a car is man made it's pretty interesting to see where the golden ratios are. The width of the wheels is too small and there position is also quite off (too much backwards). Also some shape details (like the buffer bar at the back) are missing in your drawing - chack this out carefully. I hope my observations help you as well. I don’t understand the distortion it will cause unfortunately. I used a reference but I couldn’t get one in the perspective I wanted which is why I guess it’s kind of wonky. I don’t understand foreshortening and what it involves. On first sight, it's definitely readable as a car. But some things which hit my eyes were the size of the wheels, and the shape-curves of the bonnet and the luggage space are of compared to their inner curve - causes wrong forms. And it seems that the depth seems to be too small too. -Changed the size of the wheels to make them bigger and rounder. Definitely looks better that way. -Changed the position of the front tire. The rear tire seemed to be at the right place according to your chart. Also looks better that way. Also some shape details (like the buffer bar at the back) are missing in your drawing – check this out carefully. I had noticed that as well but I’m having trouble drawing the bugger at the back with the perspective bends and twists. I think I’ll add the mirrors once the bigger issues have been solved but I will definitely add some. Hmm.. could you clarify what you mean by big sizes please, I don’t understand, sorry. I know the top is super wonky on this version but I'm having trouble. The wonky-ness comes from the roof of the car. It disappears from the viewer's perspective in more of a diagonal path instead of a curved one. By the distortions Cyan was talking, I believe, is the curves of the car. 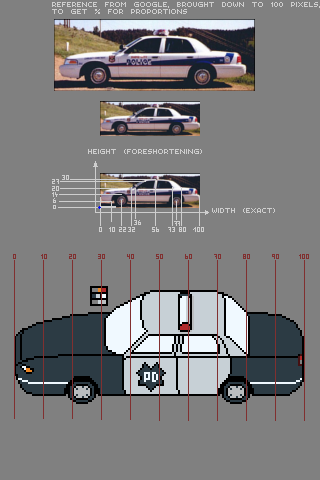 The passenger side of the car has a lot more curve than the drivers side, which completely depends on the model of the car since some cop cars are square-like while others take on a much more round form. But it seem the passenger side is a lot more round than the driver side. Of course I can be completely wrong about that. With big sizes I meant that you got the basic proporions of the length quite accurate. 2) I searched for a reference for the width of a car,. It seems to be about 45% length. 3.) I drew a ground form of the car, the biggest portion of simplified form I found - It's from the top of the wheels to the plane near above the ground. I also calculated the foreshortening at point 2 and drew the length in. v1 is in terms of forms better, because the top of the front shield is really messed up in v2 and this is really obvious. 4.5 corrects them, but isn't related to the proportion chart and the bufferbars from the explanation before aren't drawn in too and the depth is still messed up too. I think I understand most of the things you explained, Cyangmou. I think it's getting better, yes, no? Feels so lonely around here . The wheels are a bit lopsided, but I just wanted to get the point across. the wheels are indeed a bit to small *horizontally* (imho, from pre-assumed size for the car, the picture measurement ). Note, though, that they will not have 1:1 proportion between their height and width, as result of the perspective. They'll look somewhat squished.